Maitland Grossmann will play Kurri Kurri High, at Biralle Oval, in the Upper Hunter-Coalfields Area Final of the Bill Turner Trophy (Girls) after both schools recorded victories yesterday (Wednesday 30 May) at Rutherford’s Norm Chapman Oval. The yet to be scheduled match will be played possibly in the next two weeks but needs to be completed by the end of term 2. All four coaches, winners and losers, made comment after their round 3 games at a very well run gala day where good quality football was played in the right spirit. Round 3: Maitland Grossmann 6 (Teagan Douglas 3 goals, Josie Morley 3) beat ASC St Peters 4 (Taleah Mountford 3, Kaitlyn Clarke); Kurri Kurri High 3 ( Sophia Bacon 3 goals) beat St Josephs Lochinvar 2 (Trinity Smith 2). 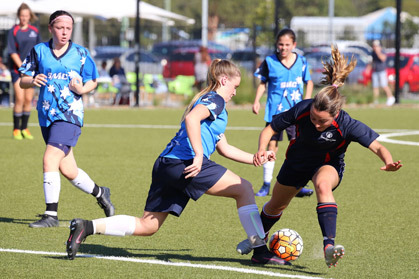 Round 2: ASC St Peters 11 (T Mountford 6, Mercedes McNabb 3, Claire Mirisch, Matiege Waddwell goals) beat Mount View High 1 (Natalie Kyprios); Maitland Grossmann 4 (Josie Morley 2, Mia Threlfo 2 goals) beat Maitland High 1 (Maddy Young); St Josephs Lochinvar 4 (Grace Kingett 3, Lillee Packham 1) beat St Josephs Aberdeen 2 (Sarah Whitley 2); Kurri Kurri High 3 (Sophia Bacon, Chloe Hope-Steel, Mew Sowihok) beat Hunter Valley Grammar 2. (Chloe Tavares, Ella Bendeich).